One of the famous myth says that a skin needs to be moisturized at all times to prevent wrinkles forming on it. Is it true? Well, it's not true and has always been false. 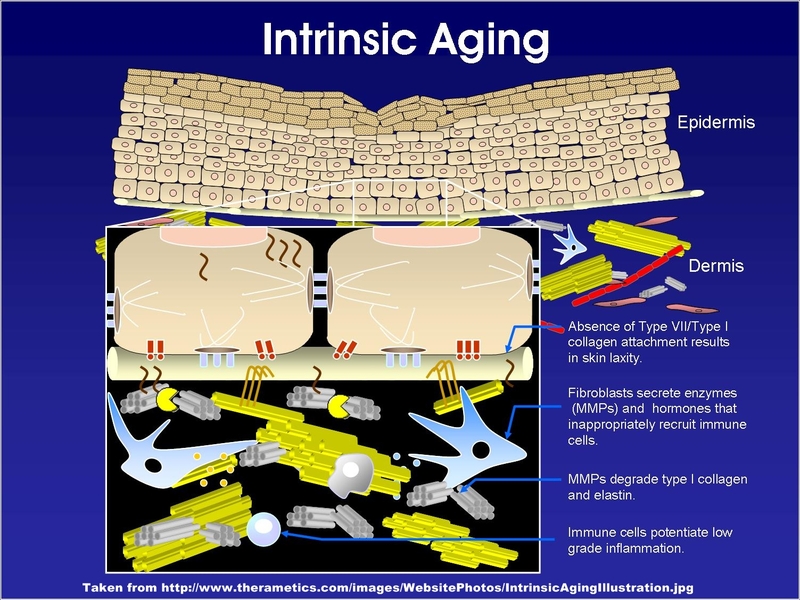 We cannot prevent the formation of wrinkles on one's skin because it is a natural process of aging as the elastin and collagen breaks down faster than they can actually form as seen on the picture of 'Intrinsic Aging' below. This is also made worse by environmental factors, such as the sun, pollution, alcohol use on skin, smoking, and facial expressions. This unbalanced process will eventually lead to fine lines and wrinkles as the stratum corneum piles up and thicken with dead skin cells, causing a very thin layer of dermis. 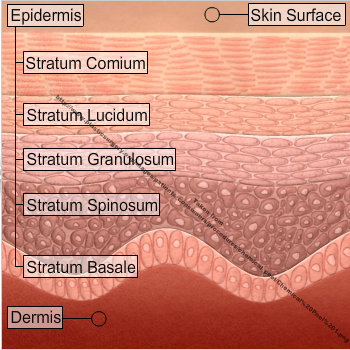 As seen on the picture above, the area with the wrinkle has a thinner layer of dermis compared to the epidermis (stratum corneum). What makes your skin look supple and firm is the layer called dermis, which needs to be thicker than the epidermis. Simply put, the thicker the dermis layer, the better and wrinkle-free looking your skin is. There are ways to make you dermis thicker and slabbing tons of moisturizer on your skin isn't one of them. 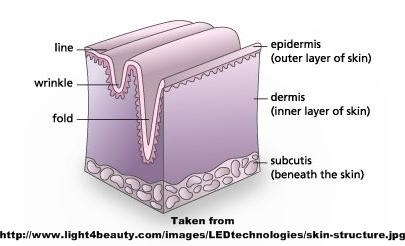 The procedures involved in making your epidermis layer (or stratum corneum to be exact) thinner so to eliminate all those dead skin cell as often seen in chemical peeling procedures. However, be sure to consult to your doctor before doing this procedure. Chemical peeling is a process where a chemical solution is applied evenly to a patient's face in order to slough off the dead skin cells, revealing a softer smoother skin which is usually the dermis. 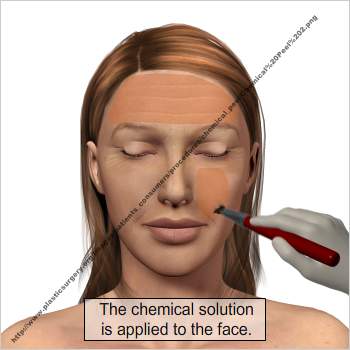 There are different types of chemical peeling solution that will cater to your skin's needs, be it dull skin, aging skin, acne prone skin, etc. This solution is designed to penetrate deep into a certain layer of the skin, depending again on your skin's need, and sheds the dead skin cells off. It usually determined by the aesthetician or dermatologist how deep the solution will penetrate your skin. As seen below, the solution can infiltrate down to the stratum basale, but it can also stop in the middle, all depending on your aesthetician/dermatologist. You might be thinking that one time when you put moisturizer on your skin, the fine lines are gone, how do you explain that, Phanie? Well, here's a thought. 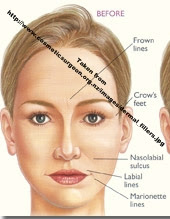 Looking back on the picture above about how wrinkles have sort off a gap between the skin? That's where your moisturizer go. In between the gaps, which helps in making the appearance of fine lines and wrinkles less visible, but keep in mind that they are still there. So, if you want to make those fine lines and wrinkles less visible, then by all means, wear moisturizer to make it happen. However, if you want better results without having to add more and more moisturizer each second of every day, then choose a procedure similar to a chemical peeling. Once again, I'm not stressing you to stop using a moisturizer, but to use it for a different purpose. One of it is to hydrate your skin so that it will be soft and smooth, instead of dry and flaky. Not for the purpose of preventing wrinkles. If you want to prevent wrinkles then avoiding the sun and wearing appropriate sunscreen is a good way to start.